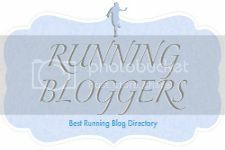 The long runs are in the bank and the fitness level is what it is. The only thing to do now is sit and wait for Marathon weekend and pray for decent weather on raceday. 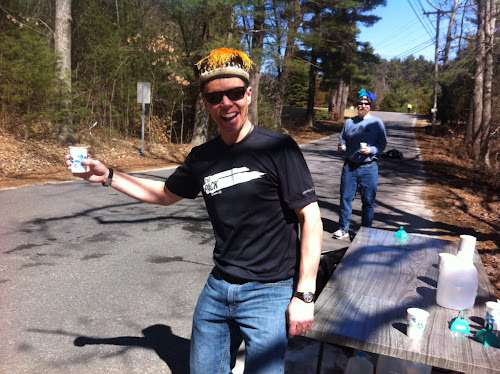 Author displaying a hint of madness while working the mile 7 water stop at the Boston Tune Up 15K. It's taper time! Taper is a necessary evil but it is evil nonetheless. I get to spend more time with the family. I get to stay in your nice warm bed on Saturday morning instead of lacing up in the dark. I get to rest up and let minor aches and pains heal. I get to spend more time writing blog posts. I get to play the "taper card" and skip a run when the weather is just a little too cold and windy. And there are a few disadvantages of taper. I get grumpy, edgy, and fidgety. Endorphin withdrawal. The marathon dreams become vivid and sometimes terrifying. My aches and pains actually seem to increase for a little while. I tend to get minor cold/flu symptoms when I take it easy for a few days. I'm not sure if this is real or not but it feels real. What happens to you when you taper? 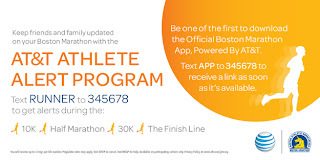 As I come up on t-minus 12 days to my first ever road marathon (That would be Boston), I am increasingly anxious. Most of my training (I am really uncomfortable with that word for some reason) has been pretty positive. A few of my longer runs were not so great but I had one or two that were incredibly encouraging. My everyday lunch runs have become increasingly faster to the point that I am continually shocked at my pace when I feel like I'm only pushing at moderate effort. I'm confident enough in my fitness level that I will try for a sub 4hr finish time but, for some reason, I am terrified of this 4 hr number. I am not afraid of failure as much as I am afraid that I will push to achieve it and miss out on the experience that is the Boston Marathon. I don't want my finish line photo to be a grimace of pain. I want to be smiling and jumping up and down and surfing on the energy of the crowd. I want to have a great time first and foremost and party the entire way. I want to remember Boston, not as a test of my fitness, but as a wonderful and happy experience.